You’re *this* close to ordering unhealthy take-out? STOP! 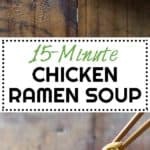 I have a healthy alternative for you: 15-Minute Ramen Noodle Soup. 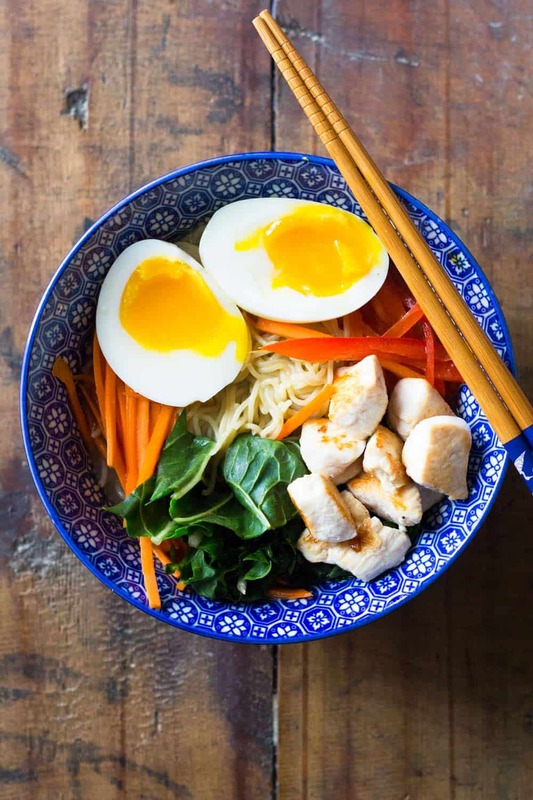 With ramen egg, chicken and tons of vegetables! Even if you have to go to the store to get the ingredients because your fridge is empty you’ll sit at your table quicker than ordering in. It won’t take longer than 10 minutes to find all you need in the store. It’s only 7 ingredients. Besides, who doesn’t like a delicious hot chicken noodle soup for dinner? Especially when it only takes 15 minutes to make. I really, really enjoyed this bone-warming, belly-kissing chicken ramen soup. Wash them, peel the ones that need peeling and then and chopping or slice or julienne as small or as thinly as possible. The vegetables won’t be cooked separately. The hot broth will heat and soften them up only a little bit. However, they have to be sliced very thinly so the broth can get to their center. 2 Cook your ramen egg to perfection. 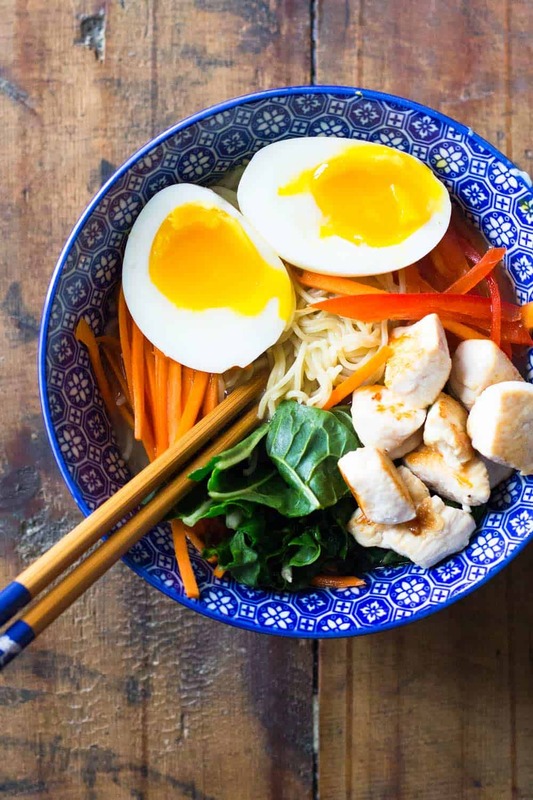 How does one cook a ramen egg to perfection you ask? It’s super easy. Bring water to the boil over high in a small pot (you can do that while cutting your vegetables). Enough to be able to submerge a whole egg. Once boiling, take out your egg from the fridge (it has to be cold). Use a slotted spoon to very carefully add the egg to the boiling water. Do this very very slowly to avoid cracks in the shell. Set a timer for 7 minutes. Wait for the water to boil again (once you add the cold egg, the boil may stop shortly), reduce heat to medium low to keep water boiling but not too hard. If the water boils too hard the eggs starts bouncing around and may crack. Now wait until the alarm goes off. Original ramen eggs are marinated. We will keep it simple today though, ok? While egg is cooking, prepare an ice bath by adding about 2 cups of cold water to a bowl and at least 15 ice cubes. Once the 7-minute alarm went off take out your egg with the slotted spoon and immediately add to the ice bath. This is needed to stop the egg from cooking further. This way you get the most delicious soft egg yolk but fully cooked through egg white, a.k.a. PERFECT RAMEN EGG! 3 Cut up and fry your chicken golden brown. While cutting vegetables, you can also start heating a pan over medium heat. Once hot, add a splash of flavorless oil. Cut chicken into small 1/2″ cubes and add to hot oil. Make sure the cubes don’t touch each other. If you are making double or triple the recipe fry chicken in 2-3 batches. If you add too many pieces to the pan, the pan gets cold and the chicken on low heat starts releasing too much liquid resulting in more of a “poached” chicken than fried chicken. Fry for about 30 seconds per side using thongs to keep turning around. When making two bowls I fry one batch while my ramen egg is cooking and another batch once the ramen egg is in the ice water. Add 2 cups of homemade chicken broth or store-bought chicken stock to the same pan you fried the chicken in and bring to the boil. Once boiling, add ramen noodles. Let cook on high for 1 minute, then reduce heat to low and let simmer another 3-ish minutes. Use a fork to separate the noodles. What’s better for Chicken Ramen Soup, homemade broth or store-bought stock? You probably already know my answer to this question. Homemade of course! However, if you don’t have any in your freezer and you are choosing to make this instead of ordering in food just buy the one with the shortest ingredient list at your local store. The shorter the ingredient list, the better the quality usually. You're *this* close to ordering unhealthy take-out? STOP! I have a healthy alternative for you: 15-Minute Ramen Noodle Soup. 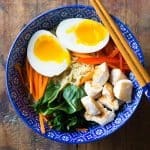 With ramen egg, chicken and tons of vegetables! Bring water to the boil in a small pot. Enough water to submerge a large egg. In the meantime, heat a large pan over medium heat, peel carrot, wash bell pepper and wash and destalk Swiss chard leaf. Then thinly slice or julienne or even chop vegetables. This should only take about 2 minutes because it's so little. Once egg water is boiling, very carefully add egg with a slotted spoon to avoid any cracks. Set timer for 7 minutes and once water is boiling again reduce heat to medium. Prepare an ice bath for the egg by adding 2 cups of water to a bowl and at least 15 ice cubes. Add a splash of flavorless oil to by now hot pan. Cut chicken into bite-sized pieces and add to hot pan. Make sure pieces don't touch each other. Fry chicken pieces for about 30 seconds per side or until gold brown. Use thongs to keep turning. Add salt if desired. Remove from pan once golden. Once egg alarm goes off, remove egg from boiling water with slotted spoon and immediately submerge in ice bath. Let sit in ice water for at least 1 minute. Add chicken broth or stock to the pan you fried the chicken in and bring to the boil. Once boiling, add ramen noodles and let water boil for 1 minutes, then reduce heat to simmer and use a fork to carefully break apart the noodles. 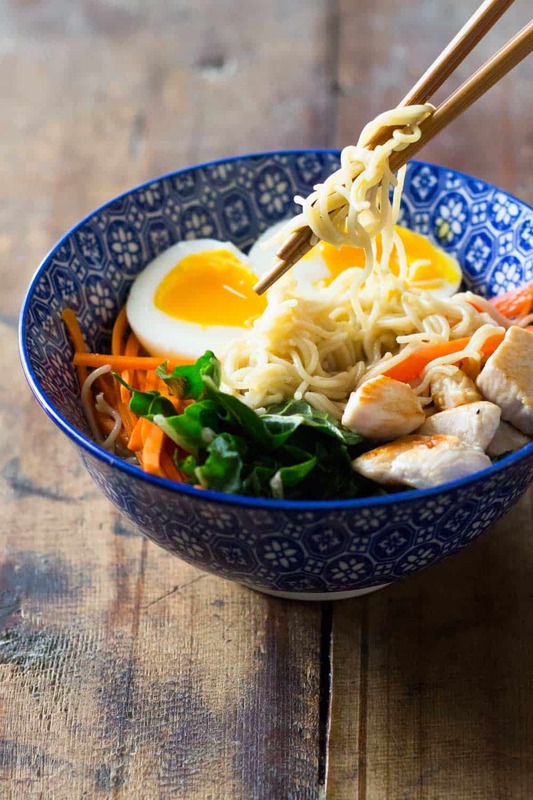 Now build your bowl by adding noodles first, then thinly sliced vegetables, then chicken, peel egg and cut in the middle and place on noodles and lastly add the hot broth over everything. YUUUUMMMM!! !